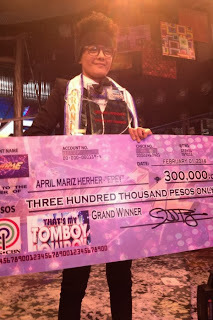 'That's My Tomboy' grand winner has been named today and she is April Mariz "Epey" Herher. 39 tomboy or 'tibo' or lesbian candidates competed to become the first ever 'That's My Tomboy' Grand Winner on ABS-CBN noontime variety show 'It's Showtime' earlier today, February 1, 2014. Out of the 39 grand finalists, the Top 10 were called to perform a talent number and then they were later trimmed down to 5 for the final Question and Answer Portion where each of them was given the common question: "Para sa 'yo, ano ang ibig sabihin ng salitang 'tagumpay'?" The answer of Candidate #10 April Mariz "Epey" Herher stood out among the 5 when she finished it with the quote "To God the honor, to my neighbors the benefit and to myself the burden" which according to her was a quote by Blessed Arnold Janssen. It obviously impressed the judges thus giving her the highest score, and crowned her as the winner. Wildcard finalist #39 Rejoice "Phao" Faraon also made buzz online when she responded "Finger Foods" to a "joke" question from Vice Ganda. The contestant answered, "Finger Foods!" I'm sure she had something else "naughty" running in her mind that's why she said finger foods. Both 'Denise Laurel' and 'Finger Foods' became Twitter's top trending topics in the Philippines. The judges who had the tough task of choosing the winner were international singing sensation (a "tomboy" herself) Charice, Comedy Queen Ai-Ai delas Alas, The Biggest Loser Pinoy Edition Doubles host Iza Calzado, hot Brazilian-Japanese model Daniel Matsunaga and resident "hurado", Sample King Jhong Hilario. Among the Top 5 finalists, my winner was actually #25 Sky Teotico, but she only finished 3rd, winning P100,000. In 2nd place winning P200,000 was #30 Kim Oriencio, an English teacher. 1. Kim Claudine Andaya from Mandaluyong City "Kim"
6. Emilia Marie Guevarra "Em-Em"
9. Jovi Lyn Ducut from San Juan City "Jovi"
10. April Mariz Herher "Epey"
11. Rio Jeeh Marasigan from Sta. Ana, Manila "Rio"
12. Adriel Muyot from Bacoor, Cavite "Gab"
13. Kier Trisha Fortuno from General Trias, Cavite "Kier"
14. Pauline Leona Flora May Dones from Sta. Ana, Manila "Pau"
15. Chelsea Kaye Estudillo from Santiago City, Isabela "Cjhay"
16. Merris Jennifer Gumila from San Roque, Cavite City "Emjae"
17. Dorina Roxas from Mandaluyong City "Ina"
18. Guia Marie Paton-og from Mandaue City, Cebu "Kid"
19. Emma Cleovelle dela Cruz from Guiguinto, Bulacan "Cleo"
20. Ayra Franchesca Monton from Biñan City, Laguna "Pot"
22. Myrhell Panganibanfrom Victoria, Laguna "Don Mario"
23. Arjean Basa from Malate, Manila "Rhaz"
24. Ma. Virginia Belano from Bacoor City, Cavite "Marvie"
29. Ma. Josefina Riguer "JM"
30. Kim Valerie Oriencio "Kim"
37. Nicole Lauren Escalderon "Nicky"
38. Whitney Cates Talens from Santiago City, Isabela "Kates"
39. 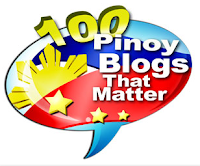 Rejoice Faraon from Malabon City "Phao"